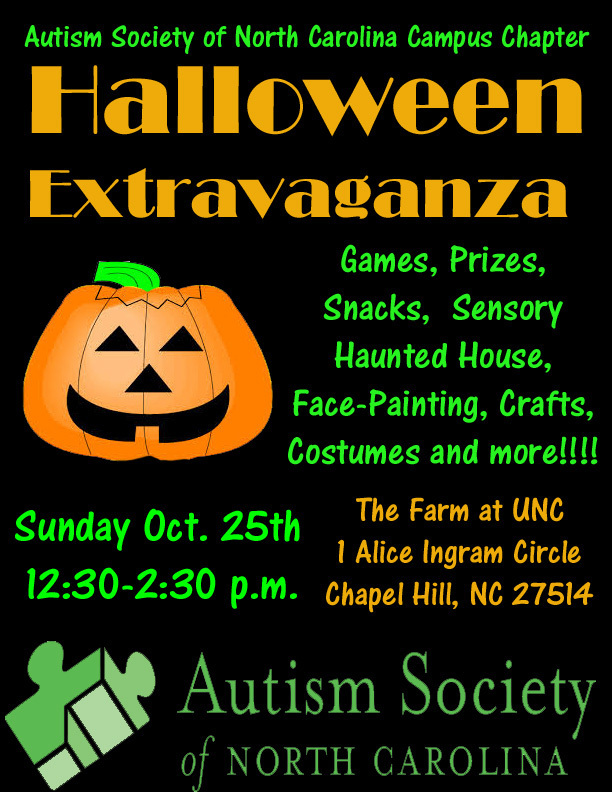 CHART: Chapel Hill Autism Resources and Tools: October in Autism: Advocacy, Coffee + Halloween Fun! Welcome to CHART! Our purpose at CHART is to connect families with the people, tools, and services that will help them to support their loved one with autism or a sensory processing disorder. We share local resources and events taking place in Chapel Hill, NC and around the Triangle. We also address national news about autism and share our personal experiences and tips. Please join us on Facebook and Twitter for the most up-to-the-minute news. 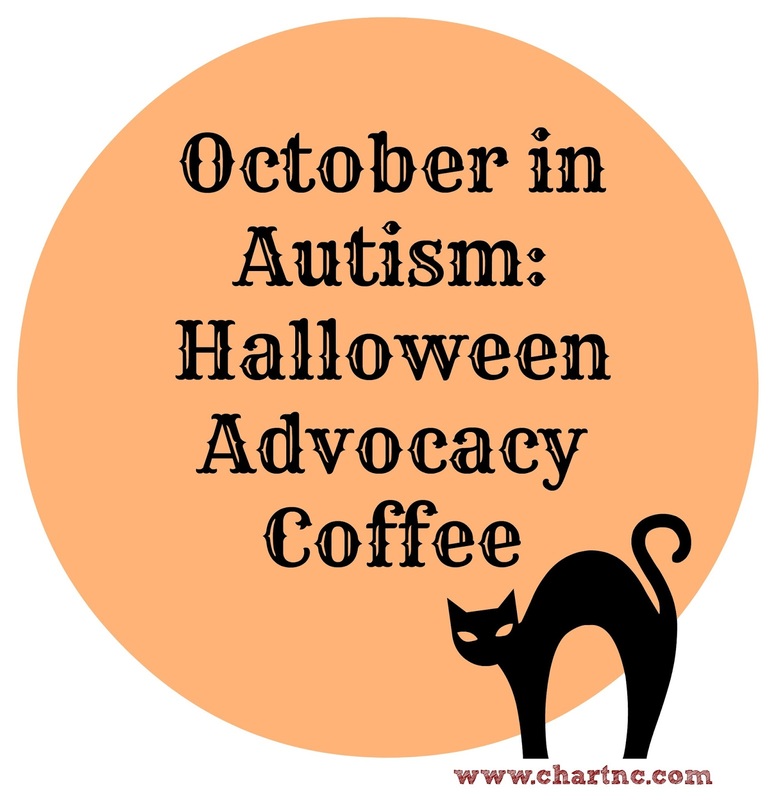 October in Autism: Advocacy, Coffee + Halloween Fun! October is a busy month, with more things happening than we can even keep up with! We'll be sharing a few highlights here; please check out our Facebook page for more frequent updates on what is happening in the world of autism around the Triangle. But before we get to what is coming up, we have to share the great news about what has already happened this October: after many years, and several false starts, North Carolina has finally passed autism insurance reform! We are so thankful for the tireless efforts of the Autism Society of North Carolina, and the countless other organizations and individuals who made this dream a reality. October SNAC Meeting: Let's Talk About It! The Power of Promoting Disability Awareness, Understanding, Acceptance and Advocacy. It is never too early to start teaching a child with a disability how he or she can advocate for himself or herself. Like many other important life skills, self-advocacy is a critical tool a child needs in order to achieve goals, increase self-sufficiency, and become a successful young adult. It is a life-long process that begins with parents or caregivers “talking about it” with both the child and others. Talking about a child’s disability involves promoting awareness, understanding, acceptance and advocacy. This presentation will focus on talking with a child about his/her disability as well as educating family members, friends, neighbors, the school community and others. Assisting the adult child advocating for him/herself with employers will also be touched on. A number of approaches will be examined highlighting the importance of the child becoming a self-advocate and a valued member of the community as they grow into adulthood and into the work world. Join the Autism Society of North Carolina Orange Chatham for their monthly coffee gathering! The coffee gatherings are a great chance to meet parents, grandparents, and others who care about someone on the autism spectrum. Meet in the front meeting room at The Egg and I for coffee and casual conversation. And now for something just plain fun! Join the Autism Society of North Carolina UNC Chapel Hill Campus Chapter for their annual Halloween Extravaganza this weekend. There will be games, prizes, snacks, a sensory haunted house, face-painting, crafts, costumes and more. All families affected by autism or other developmental disabilities are welcome. Admission is free, although donations are welcomed. Get out there and vote, friends! Bridget and Peter Mora created CHART as a place to gather and share the outstanding local autism resources available in the Triangle region of North Carolina. We are passionate about autism advocacy, strong public schools, and supporting local non-profits.